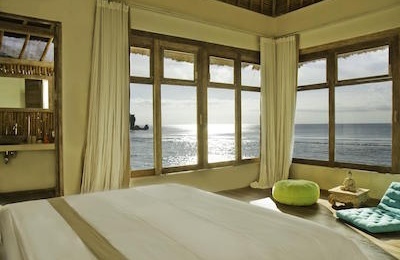 Ekas Surf Resort - South West, Lombok Guests overall rating: ☆☆☆☆☆ 0 based on 0 reviews. 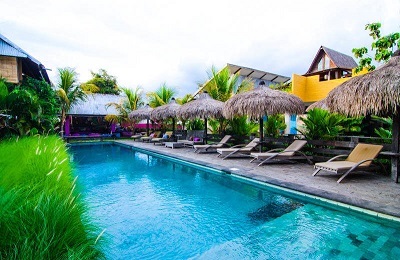 Ekas Surf Resort is located in East Lombok, 60 minutes away from Lombok International Airport. Our bungalows are 25 sqm or 270 sqft. Our family suites are 50 sqm or 540 sqft. All rooms come with air conditioning, hot water, and a private ensuite bathroom. With our 30+ staff working at the premises, we strive to offer our guests comfortable and affordable accommodation. The spacious and green environment at the resort is ideal to chill between sessions. Grab a snack, have a dip in the pool or have a message. Everything is provided to make sure you feel relaxed for your next surf or kite. And if you do not surf or kite, go on one of our tours and discover all Lombok has to offer from beautiful sceneries to cultural visits. We are open all year long which allows surf for all levels and seasons. We are located 1.5 km from the beach. All local shuttles to the surrounding beaches are free of charge and operated with our pick-up and van. The hotel restaurant offers a variety of Western and local Indonesian dishes, all sourced locally. Breakfast, lunch and dinner are served in the spacious restaurant made from local bamboo and overlooking the resort. Ekas Surf Resort is specialized in providing outdoor and fun activities with a special focus on watersports. Surf is on all year. During the period from April to December, three surf breaks are working and named Inside Ekas, Outside Ekas and Beach Break. During the rainy season, a fourth break rock named Southern Reef. We operate all transfers privately. Land transportation is free with our shuttles to the surrounding beaches. Our 2 private boats otherwise offer flexibility and comfort. Surf board rental, Surf lessons and surf guides are also available. Ekas Surf Resort is ideally located, we’re only 15 minutes from Ekas Bay. You can reach the four un-crowded surf breaks easily. Description: The bigger of the 2 waves in the bay. Type: It is a long, powerfull hollow wall that breaks left, on reef, under a cliff face. Surf level: More experienced surfer as there’s a lot of water moving. Suitable for intermediate surfers on smaller days. Description: located close to the Ekas Village. Type: long wave breaking far inside the bay as a peak in both right and left. Surf level: The right is a high-quality wave, particularly on low tide, suitable for advanced surfers. The left winds down the reef at high tide, a softer wave ideal for the less experienced surfer. Both short and long boards are suitable on the left. Description: This break in front of Runcan beach, far inside Ekas Bay. Type: This is a left and right beach break peak that’s ideal for learning surfing. Description: Depending on the tide, swell and wind there are other potential waves in the nearby Southern Reefs. These are good in the wet season, or early mornings before the wind comes up in the dry season with north-west winds. Type: Hollow left and right peaks break in small swells. In large swells, one newly discovered hollow right winds over 800m down the open coast. Kiteboarding is on from May to September during the wind season. Winds range from 15 to 25 knots with 12M being the ideal kite size. Several privately organized tours are available to discover cultural attractions, beaches, and waterfalls. Massage: The traditional Sasak massage is a fusion of Tuina techniques from China, Ayurvedic massage from India and local tradition. We use a fragrant oil and a combination of soft and strong pressure in order to circulate the energies. This is the perfect way to end the day after a strong session of surf, kiteboard or other outdoor activities. 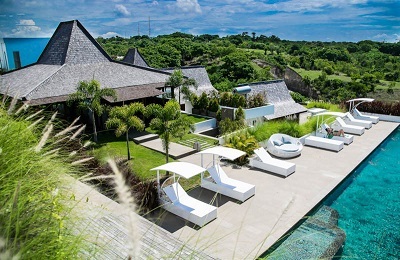 Ekas Breaks is located in a beautiful, remote and un-crowded part of East Lombok. The resort is only one hour drive from the international airport of Praya and the well-known surf destination Kuta. It’s a perfect place for surfers, kitesurfers and those with a sense of adventure. With its unspoiled landscape and loads of outdoor activities, it is truly a unique experience! Singapore and Kuala Lumpur offer direct flights to Lombok International Airport with respectively Silk Air and Air Asia. Garuda and Lion Air offer cheap and daily flights from Jakarta and Bali to Lombok.